Columbus visited this this volcanic, reef-encircled island in 1493, naming it for his younger brother, Bartoloméo. He was met by Caribs, with whom disputes made lasting European settlement difficult for most of the following 300 years. However, history shows that the Arawak amerindians had beaten both Columbus and the Caribs to the island as early as the 10th century. They named it Ouanalao. Although the meaning is still uncertain, according to the predominant accounts Ouanalao means either Iguana Island or pelicans - the latter now featured on both sides of the island's coat of arms (along with the Maltese cross, and symbols of the French and Swedish crowns). Your hosts chose Ouanalao as the name of their new vacation retreat. The name ties the traditional and the modern, the past and the present. And pays homage to St Barthélemy's history of Arawak, Carib, Maltese (Knights Hospitaller), Breton, Normand, British and Swedish settlement and melded influence. Together, your hosts have twenty years experience visiting this this exceptional island. Seduced by the island's subtle charms, they longed for a place of their own. Due to the high cost of land and the challenges of construction in a volcanic mountainous environment, this dream remained confined to the ever-growing box of personal and kitchen items that they left on the island between visits. This started to change in 2015. Local friends who had become your hosts' second family - one of whom is an 11th generation descendant of original French settlers - started building their own luxury villa on a hillside plot that has the one of the best ocean views in the Caribbean. The couple decided to include a two bedroom ground floor villa apartment (70 sq. m / 740 sq. ft interior) having the same resplendent view over the open Atlantic as the main villa. In early 2016, they offered your hosts a long-term lease. With this once-in-a-lifetime opportunity came generous sub-rental rights to vacationers, as well as liberal input into the villa apartment's design, materials, appliances and pool design. Since then, your hosts have visited the chantier (worksite) several times to monitor the progress, meet local contractors and provide extra labor. All has been to exacting standards of workmanship and in conformity with the very latest French building norms. Construction is virtually complete; furniture, appliances, dishes, kitchenware, artwork and decoration are all installed. An 8m long lane pool was excavated in July 2017 and is scheduled for completion in October. Your hosts will soon be able to share with visitors their love of the island, local knowledge and contacts. 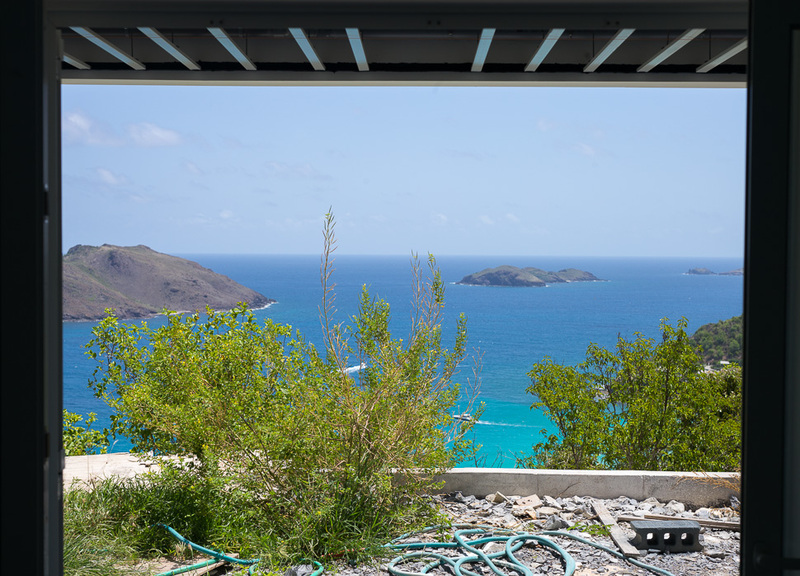 Upon completion in 4th quarter 2017, your hosts will offer this unique blend of tradition and modernity - St. Barts chic - to discerning visitors from around the world. Ouanalao will be available for rent on a weekly or monthly basis, with the one-off possibility of longer stays for travelers seeking extended breaks from their quotidien. Please explore this site to see whether a stay at Ouanalao would satisfy your vacation needs and budget. We are confident that you will find that it represents extraordinary value when considering its practical location, breathtaking views, exquisite décor and thoughtful conveniences. please visit Villa Léana, our adjacent sister property.